With running, it is easy to see your progress by watching your pace for the interval splits. But with a bike, your speed is dependent on much more than just how much effort your are putting in. I tried to use a repeatable, mostly circular course to cancel out the effects of wind and incline. I figured if I averaged my speed during all the intervals that would be an indication of my fitness. However since I started to train with a power meter, I see that my prior approach is not sufficient. Take a look at this graph of four workouts done during the same year. If I based my estimate only on speed I would have thought I had declined during the last interval workout, but I actually improved by looking at the average power of the intervals. 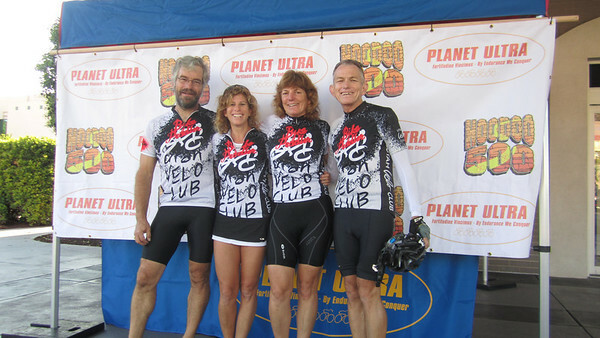 Team Turbo Dog already held course records for the Hoodoo 500, including two person mixed team and two tandem mixed, so it seemed like a great idea to try to set a course record in another category, the 4 person mixed team. David and Deb Hoag contacted Franz Kelsch to see if he would join the team and he was excited to do so. With Franz’s age, we had a lot of flexibility on getting a second female on the team and still be in the 50+ category. Lonni Goldman has not competed in these type of events before but had recently completed some difficult double centuries very well. She was excited to join the team. 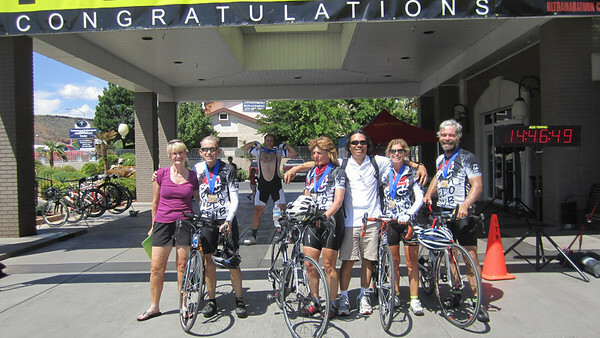 The four of us met together and felt we would be able to break the existing 4 person 50+ mixed record, which was over 33 hours and maybe even the overall 4X mixed record, which exceeded 32 hours. David even was bold enough to suggest we could break 30 hours. Why not? We asked Guy Batistia to crew for us and fortunately he accepted. Guy proved to not only be great at crewing but he is also a great photographer and took many of these photos. He, along with David and Deb were able to come up to the Kelsch’s Utah home a week before the event. Anne Kelsch was a tremendous help, not only hosting the team for several days, but riding with us and helping us work out our plans and get organized. We were also able to do some high altitude training. Our fist outing was up to Mirror Lake. After reaching the summit at over 10,700 feet, David and Franz descended down part way on the other side to see the lake. The next few days included some more riding and hiking. 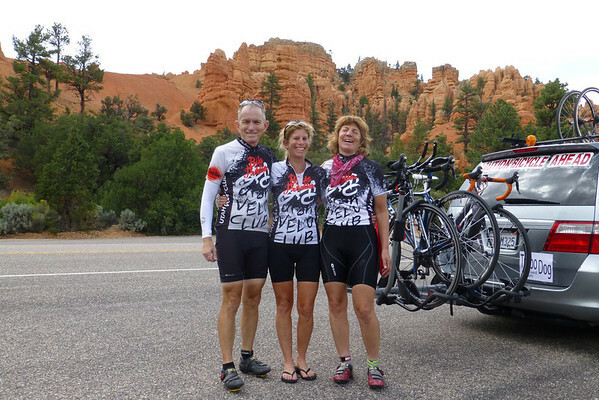 On Tuesday Franz and David joined the Utah Velo club for their hill climb ride. When David saw everyone wearing the club jersey he decided to buy his own. Unlike some teams that go to great efforts to have some custom jersey made, we didn’t really have a common jersey, so why not just get a couple more of the Utah Velo jerseys. 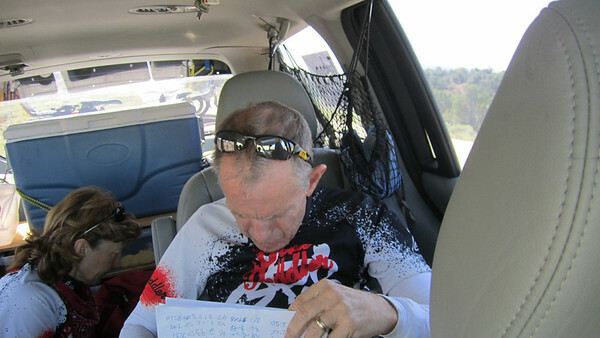 On Thursday we drove from Orem Utah to St. George while our 4th team member, Lonni, flew to the St. George airport. Being a 4X team, we did not have to start the race until 9 am on Friday. Franz took the first section, that included 9 miles of a neutralized start and another 8 miles of racing. He was surprised that as soon as the racing started, he was quickly passed by everyone going up an incline. Figuring it was the excitement of the moment, he kept his pace and eventually passed all but the lead two riders and nearly caught the young rider from Team Chubby before the first rider switch. David then took the next segment because like the first, you could not have SAG support during part of it. It was then cat and mouse with Team Chubby, passing them, then getting passed, depending on who was riding from each team. We then went into a four person rotation, with the plan of 30 minutes for each rider. Being the daytime the van would leap frog the rider, then wait for the rider to pass. When it approached the time for a rider swap, Guy would go ahead of the rider far enough to give the next rider time enough to get ready. The new rider would watch for the approaching rider and then try to come up to speed before they overlapped wheels. The 30 minutes were a bit more like 25 minutes, but even that seemed long enough. The route took us down into Arizona, then back into Utah and through the town of Kanab for the first time station which we reached at 1:17 pm. 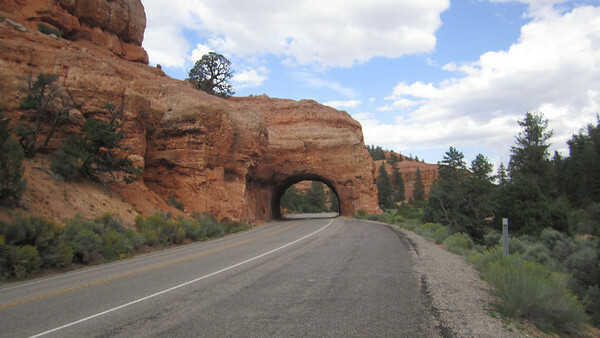 It was then up Highway 89 with a right turn up SR-12 towards Bryce Canyon. There was a bike trail we needed to go on, and with the 3rd place where no SAG support would be available, David took this segment while the rest of us enjoyed the beautiful surroundings. At the end of the bicycle trail, at time station #2, Deb took a turn at 5:12 pm. The route actually does not go to Bryce Canyon, but instead continues straight. Deb had the chance of making the first of the long descents toward Escalante. Next it was Lonni’s turn, passing through Escalante at 7:40 pm, where there was time station #3. As we approached Boulder, it was starting to get dusk and we were headed into what seemed like a long period of darkness. We passed through Bolder at 10:50 pm, then there is a long sustained climb up to an elevation of over 9,500 feet. We reached the summit just before 11 pm, where David took the fast descent. It was past midnight when we finally reached time station #5 in Loa, where we had another climb. Franz took the rotation as we approached the summit since there was a turn at the bottom of a fast descent that he was familiar with. Plus Franz had this super bright light so he could go 40 mph without the need of the headlights from the van. Riding in the darkness is kind of a daze. When you are off the bike you are trying to get some sleep but no one was able to really sleep. We gave Guy a break from driving and he went to the back to sleep, but he was so excited he kept talking! Later in the evening, he took a 2nd break and this time, he might have got some rest. Franz started to calculate how many more times he would need to take a rotation in the dark. We were moving so fast that unlike prior years, we reached Hwy 89 in total darkness and it was dark the whole 30 miles to Panguitch for time station #5, which we reached at 6:10 pm. David took the first rotation out of there where we started the biggest sustained climb of the route, that would eventually take us to over 10,000 feet. We decided to reduce the rotations from 30 minutes to 20 minutes for this section. It was great to see the sun rise as we were climbing up SR-1478 toward Cedar Breaks. The temperatures at night had gone down to 45 degrees, but the sun was starting to warm the air as we were climbing higher. David, being such a great descender, was elected to take the fast descent to Cedar City, while Franz took a rotation before reaching the town since he knew all the turns. It was a good thing because the street was blocked for a local celebration, but Franz knew Cedar City well enough to take a slight detour. Then he headed out SF-56 while the van arrived at time station #6 at 10:10 am. That was so much earlier than other times when it was usually afternoon and people in the van wanted to stop and get some lunch. This time the van continued on and we all felt like we were on a mission. We continued in our normal rotation of 30 minutes each while Franz was calculating when we might be able to finish. At that point we had been averaging about 17.2 mph, which would put us into the finish slightly over 30 hours from the start. So our idea of coming under 30 hours started to become a reality. The last segment, from the top of Snow Canyon, is about 14 miles to the finish and usually teams all ride in together. But we wanted to break 30 hours so we decided to have David do that section ahead of the rest of us. Franz took the final section before Snow Canyon, trying to give us as much cushion as he could, and everyone was surprised when he reached the last time station at 2:04 pm, just over 29 hours from the start. From there David took off by himself while Franz, Deb and Lonni followed (Franz was still trying to catch his breath). We knew Team Chubby was not too far ahead of us because their support van was pulling out of the parking lot at the top of Snow Canyon just as our van was arriving. David was able to catch them during this last segment and all decided to have a gentleman’s tie at the finish. Lonni, Deb and Franz arrived at the finish line 7 minutes after that. We finished the 517 mile race in the early afternoon of Saturday, with a total time of 29 hours and 35 minutes, setting a new course record for 50+ mixed, actually setting a record for a 4x mixed team of any age. It is now 5 am and we are so much looking forward to the sunrise. It has been a long night bit we have now only 20 miles until Pangeitch. Now on Highway 89, 4 hours into race. We took over 2nd place as we entered Arizona. We are now 2.5 hours into the race. We have completed rider check-in and vehicle inspection. Finished eating at the Black Bear diner. We start the race at 9 am in the morning. With less than 48 hours left before the race starts on Friday morning at 9 am, the team is making final preparations. We have purchased all the food, tested out out lighting system, have the required reflective material on the bikes and have all the required signs for the van ready. Tomorrow morning we will all be leaving for St. George to pickup our 4th team member, Lonni, then go to the hotel for rider check-in and vehicle inspection. David and Deb Hoag and Guy Batista arrived on Saturday evening from California so we had a chance to do some riding at high altitude. On Sunday we drove up to Kamas and biked from there up the Mirror Lake highway. At the summit the elevation is as high as you go on the Hoodoo 500. David and Franz decided to go a bit further and biked down the far side a couple of miles to see Mirror Lake. 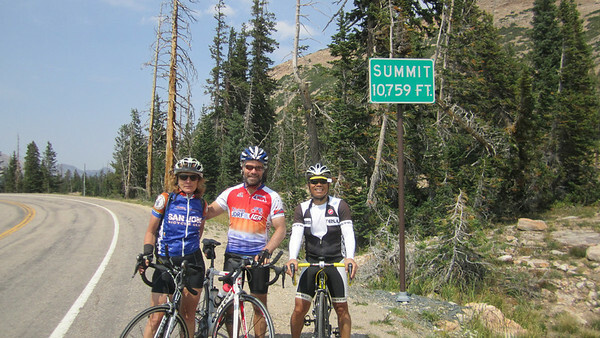 On Monday, while David needed to work, Anne and Franz on the tandem took Deb and Guy up the Alpine Loop. The summit is not as high as the prior day, but still over 8,000 feet. On Tuesday we decided to take a break from biking and do a hike. It was a 1.5 mile high up over 1,000 feet to the entrance of Timponogos Cave. That evening Franz and David biked over to the Utah Velo hill climb ride while Anne took Deb and Guy up the bike trail to Vivian Park. On Wednesday it was just an easy ride. With the Hoodoo 500 race starting in 48 hours, our training is over. 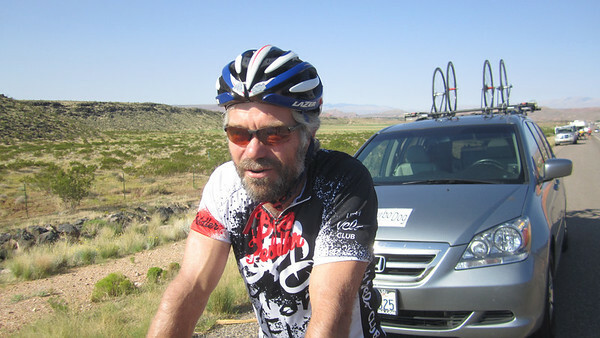 Franz completed his last big training ride for the Hoodoo 500. With only 5 days before the race, other rides are going to be in the Active Recovery zone.